You want to know one of the best comics you should be reading? 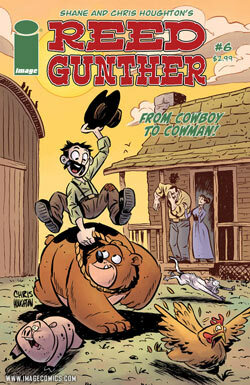 Reed Gunther #6, by Chris Houghton and Shane Houghton, from Image comics. I know what you’re saying: “But it’s issue six, and I haven’t read the previous five issues!” That’s fine, because this is a one-shot that explains how Reed (The Cowboy) met up with Sterling (The Bear). Without giving too much detail about this issue, we find out that Reed had a hard time following in his father’s footsteps as a young child. Yet Chris Houghton does a fabulous job of illustrating the love that Reed has for his father at the same time. We also see the worries that a father has for his young son: that he may not be cut out for thisworld. This is some of Chris’s best work I have seen in his young talented career. and I love the book. It has a very simple quality that we don’t see often in comics anymore – that is, it is just fun. Shane also talks about some serious issues, like what if you don’t live up to your father’s expectations. That is a problem that we see in this issue, but at the same time, we see some goofy solutions to the problems, that can only be told in comics. another kids book, that’s not for me.” But guess what? If you’re not reading Reed Gunther, you just missed out on the most fun comic of 2011. The good news is, the year is not over yet. The first paperback just came out. Do yourself a favor and pick up this book – honestly, I don’t know what else to say. for anyone who enjoys great comics.